Hello and welcome to Challenge 5, the final event in the Lambda Cup, a series of five Source single player mapping challenges. For this challenge, we would like to you create a map that is fun to replay – or that specifically rewards you for playing through again. Variety is the spice of life, so offering the player different experiences during playthroughs is key. One way to do this is by offering the player choices. Choice of path, or weapons, or companions, and so on. Randomness can also make significant changes to the experience. Random enemy locations, random timing of attacks, or even random map layout changes that can lead to interesting playthroughs are all fair game. Ideally the player’s choices or any random elements will impact the playthrough and offer variety on a replay. Your entry could be a hub-type map where the player must achieve an overarching goal by completing a number of smaller goals. The hub area would lead to various points where the player performs an action that has consequences in the other parts of the map. For example, the player chooses to clear a building of zombies first and then attempts to pass a city street which has a sniper. Because there are no zombies left, the player finds it harder to reach the sniper since they are the only target left. If the player had attacked the sniper first, they would have found a shotgun which would have made it much easier to kill the zombies. But, because the sniper was killed first, they would find a lot more zombies in the building than in the first scenario. In this case, “hub” doesn’t necessarily mean a map with corridors and portals – the hub area could just as easily be a crossroads in the forest, for example. “Hub” here just means a central area connecting to a variety of areas, where the player can make choices about how to proceed. If there is an overarching goal, it should be clear to the player – and ideally the smaller goals tie in sensibly to the larger goal. (Think of Blast Pit, where the player had to turn on the oxygen, fuel, and the power in order to fire the test engine to proceed past the tentacles. It’s not a good example for replayability, just for how an overarching goal can be linked to smaller goals). 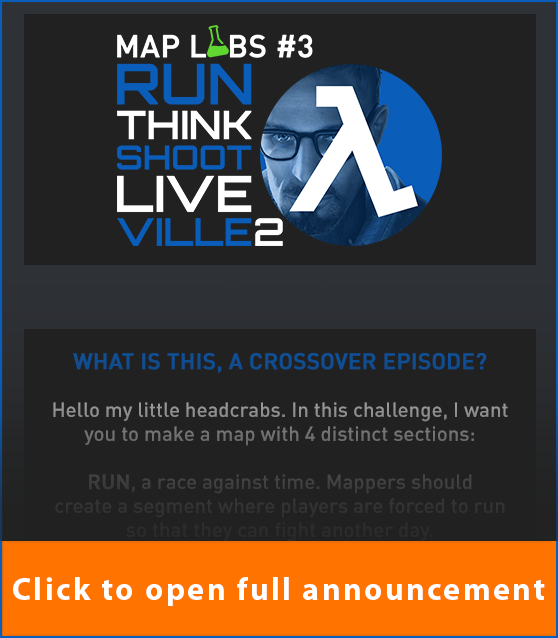 Your entry could also be one where the player has to find the “correct” route in order to complete the map – along the lines of ChaseVille or some of the maps in the recent 72-Second Experiment. But keep in mind that it should be fun to replay – not frustrating and almost certainly not time-limited. Or perhaps the player learns something during playing your map that allows for a totally different approach on a replay. For this challenge the usual limit of 2 maps is removed. However, please don’t take that to mean you should build 10 maps. We have removed this limitation to allow interesting “jumps” to each section, IF the mapper chooses to create a hub-style map. As always, if you have any questions or doubts, please ask. If you want a private answer, please send an email to RunThinkShootLive@gmail.com – NOT planetphillip@gmail.com. Good luck! Hello and welcome to Challenge 4 in the Lambda Cup, a series of five Source single player mapping challenges. If you are new to my mapping challenges, please see the event’s homepage: THE LAMBDA CUP 2018 as well as the CALENDAR of the mapping challenges for the entire 2018. 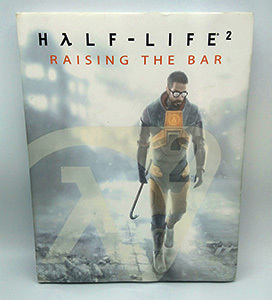 The tagline of Half-Life is “Run. Think. Shoot. Live.”. You should know that but not everybody does. That’s where the name of this website comes from. Let me put it simply: You have 72 hours to make a map with EXACTLY 72 seconds of playtime. We often talk about how it’s better to have shorter, more polished maps than longer weaker ones. By “polished”, we do not just mean visuals (lighting, textures, environmental art), but also gameplay, interaction, storytelling, soundscapes etc. You can make your map action packed or only have a few interactions. It could be a beautiful scene that the player walks through and relaxes, a non-stop gunfight, or anything in between. For example, you could create a map that can be finished in 72-seconds but only if done perfectly. That would allow replayability in trying to find the optimum way to complete the map. You can simply submit a map that can be played in one 72-second sitting. There is an OPTIONAL template for you to use, that fades in from black, lasts 72 seconds and then fades out. The fades last 1 second each. Mappers may extend the “black screen” time at either or both ends of the map, to display text. Ideally, we would like the text to be kept to a minimum. Everything should really be contained within the 72-seconds gameplay. Locations, events, style of map are all open. The only limitation is the 72 seconds. Be aware that the minimum AND maximum playtime of the map is 72 seconds. Don’t think that you can create a huge map and allow the player to reach certain points and autosaves. That is not the idea we are looking for. If your map lasts longer than 72-seconds after the fade-in, it will be considered a bonus map. We’ve all been there – reaching the end of a game or chapter and having to face the BOSS. Usually, it’s a single all-powerful enemy. Well, almost all-powerful – inevitably after enough dancing around each other, you find its weak spot and exploit it. Hooray! Not really – it’s totally expected, uninteresting, and cliched. For this challenge, we would like you to take the idea of a final battle and breathe new life into the scenario. Of course, that’s easier said than done. We don’t want you to necessarily focus on a single enemy, although you can have that kind of boss if you want. But you’re also allowed to have multiple boss enemies, or one big bad boss with other minions helping. Imagine a pair of bosses working against you and maybe even each other. Even though this challenge is called BossVille, you don’t have to make a boss fight. We really like the hectic finale in Episode 2, where you had to fend off striders and hunters while driving all over the place. We want to encourage clever twists on the classic boss fight – and we’re definitely keeping an open mind as to what’s acceptable in BossVille. All we’re looking for is a great finale, boss fight or not! Make the encounter interesting! Perhaps the boss fight has several phases – where the boss changes its attack patterns, or its behavior, or the environment. Maybe you encounter the same enemy multiple times throughout the map, setting him up as the Big Bad and leading up to a great finale fight. Maybe we have to outwit the enemy instead of fighting them? The core concept of a climactic finale is the key here. Use a single boss in ways we’ve never seen, or come up with your own intriguing final faceoff! RTSL game coming to Steam! Right, so I suspect you are A: pretty excited and B: a little confused by the title. Hopefully, after you have finished reading this post you will still be excited but not confused. I will explain as much as I can, but please bear in mind, that some things will remain secret for various reasons. Essentially, near the end of this year or the beginning of next year, we will be releasing a compilation of the best maps entered for the mapping challenges over the last few years. Let me address the use of the word “Game”, it seems that currently the release will be a game in the sense that it will not require the purchase or installation of ANY other Half-Life game. Half-Life 2 has been around for longer than 13 years, but many will agree that the game has still not lost its charm. However, as Episode 1 and 2 came out, people switched their focus to the new environments and gameplay that were introduced. NostalgiaVille seeks to balance out the scale by re-introducing the classic environments of Half-Life 2 in the modern day. In this challenge, you are given 2 months to create a level set in the early chapters of Half-Life 2 (think City 17 up to and including the Coast, however we find that the City and Canal sections in their pre-Uprising state are the least prominent within usual challenge entries). Don’t feel pressured to work for the whole 2 months, as that would mean a high risk of burning out, but consider the possibilities for the scope and scale of your entry. A big focus of NostalgiaVille is, well, Nostalgia. The player should be reminded of the time when they first played Half-Life 2, and levels should, to some degree, feel familiar. So feel free to include HL2 Easter eggs, references, and maybe even altered segments of the original chapters in your entries. However, with time, technology and level design practices have improved. We would like the early Half-Life 2 environments to be used and a level of familiarity in the level design to be kept, but gameplay can be either similar to the way it was in the original game or changed to add new concepts into the old environments, thus combining the new and old in your entry. Keep in mind that even if your map follows the same ideas from the environments in Half-Life 2, it should be polished and up-to-date with modern standards in other design aspects. This experimental mapping challenge has two aspects. For this challenge, we would like you to find a partner and work with them on the entry. As part of your entry, you MUST include a readme that states what each person did. Your partner does NOT have to be another mapper, but can be. They could be an environmental artist, a modeller, a sound/music artist, a texture artist – it’s YOUR choice. It’s impossible for us to define or check how much each partner does, but we would like to feel it’s a minimum of 70/30. Meaning that the junior partner does at least 30% of the work. For this challenge, we would like you to take one aspect of Half-Life, Half-Life 2, Ep1 or Ep2 and take it to the extreme. Firstly, that doesn’t mean simply adding hundreds of enemies or set the whole map a standard vent. We accept that thoughtless and over-use of any aspect of any game can produce boring maps, so the judges hope for clever intepretations of the theme. You may set your maps in whatever location you choose and they can be as short or as long as you want. Think carefully about the three games above and try to find some aspects that will produce some unusual and interesting maps. Here is an example, although we hope you consider other things. Exploding Barrels. Imagine a map whose only form of attack was with exploding barrels. Perhaps the enemies are behind defenses that your weapons can not penetrate or maybe barrels must be placed against walls to progress. Or even a puzzle where the barrels must be placed in certain places to allow a chain-reaction. That might lead to some fun maps. Simply adding lots of exploding barrels to a level is not what we are looking. You just have to find an aspect that interests you and take it to the extreme. Remember, this is an experimental mapping challenge and therefore it is about pushing the limits. GOOD LUCK! 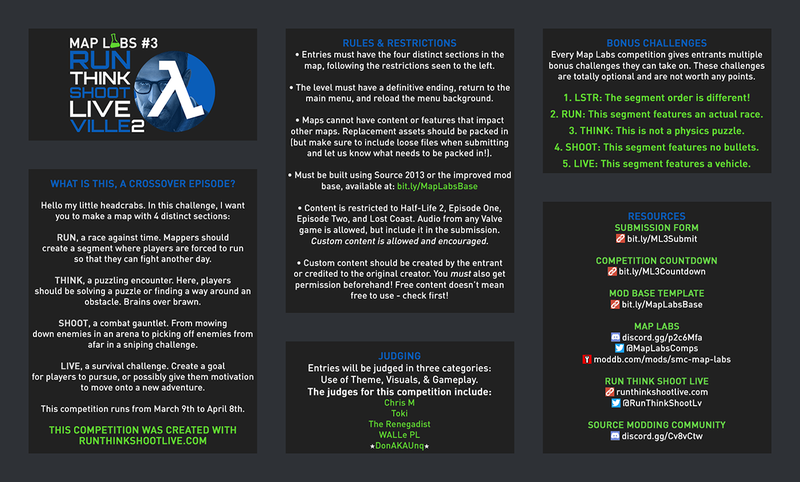 Hello and welcome to the Lambda Cup, a series of five HL2:Ep2 single player mapping challenges. Half-Life 2’s revolutionary weapon was undoubtedly the Zero Point Energy Field Manipulator. You can call it that if you really want to. But to us it’s the Gravity Gun. A simple concept, executed perfectly in the game – and the perfect tool to show off the physics engine. We learned the basics in Black Mesa East, experimented with its lethality in Ravenholm, and used it from then on for exciting activities such as stacking crates, tossing barrels, shoving around poor headcrabs, and eventually making Combine soldiers into personal ragdolls. We want you to create a map that features the Gravity Gun. In addition, besides the Gravity Gun, optionally the player may obtain and carry the crowbar and only one other weapon. Note that this restriction is on Gordon’s standard weapons – so objects like hopper mines and Magnusson Devices do not count as the other weapon and may be used freely. Use of the Stasis Crystal is optional in this challenge. Mappers can give players the classic Gravity Gun or the Super Gravity Gun – and both versions may be enhanced with the Stasis Crystal. We’d love to see what you can do with the Stasis Crystal, but the regular old Gravity Gun is fun too. Wow us! we’re really looking forward to playing with the grav gun in whatever kind of maps you can dream up and build!